I hope you've had a great week! This has been a very productive and inspiring few days for me, and I was especially proud to join with my colleagues to celebrate International Women's Day on Wednesday, March 8.
International Women's Day is a time to celebrate the enormous progress we've made as a country and globally when it comes to ensuring women have the same rights as men, but it is also a day for us to recommit ourselves to this important work. We have come a long way, but there is still so much to do for the women of the world. That's why I wore red and stood in solidarity with my colleagues in front of the Capitol and called for equal pay for equal work, as well as family-friendly policies. 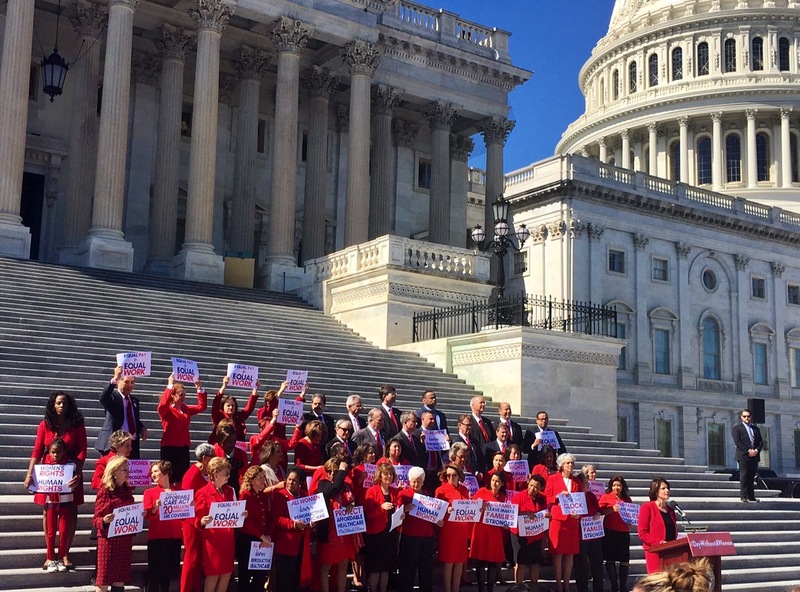 Wearing red and standing on the steps of the Capitol with my colleagues to fight for women's rights! Our nation can't achieve its full potential if women continue to be paid less than their male colleagues and paid family is out of reach for far too many. Simply put, when women thrive, families and communities thrive as well. On Tuesday, House Republicans revealed their bill to repeal and replace the Affordable Care Act. It is clear why Republicans felt it necessary to hide the bill under lock and key. The proposed bill would increase health care costs, limit access, and cover fewer Americans. Under the bill, seniors would see the biggest increase in costs while those with chronic conditions and disabilities would struggle to maintain and afford coverage. The bill also ends the Medicaid expansion that has been so important in covering individuals who have been affected by the substance use epidemic in New Hampshire. Furthermore, it endangers substance use and mental health coverage by removing the requirement that these services be covered under Medicaid. Finally, the legislation defunds Planned Parenthood, removing this critical lifeline for women's health services. 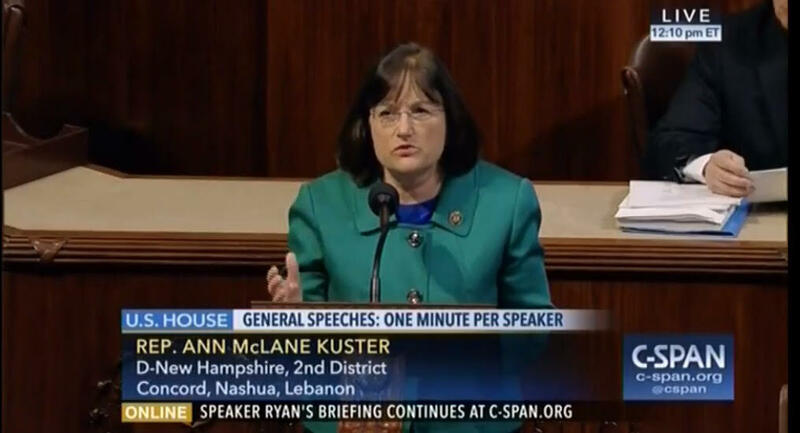 Speaking on the House floor against the Republicans proposed bill to repeal and replace the Affordable Care Act. These proposed measures do nothing to increase actual access to healthcare. In fact, the Republican plan would limit or take away healthcare for thousands of people throughout New Hampshire and millions of Americans nationwide. I am ready to get to work to rethink this misguided approach and instead find ways to help improve healthcare for every citizen. As always, thank you for everything that you do to make New Hampshire such a wonderful place to live! Do not hesitate to reach out to my office if we can be helpful to you or your family.